Okay, the best laid plans of mice and men eh! We'd planned our getaway this morning and had it all figured out, we'd arranged to leave our two large bags at the hotel and only take our two small carry on bags, after checking them in we would walk over to the terminal, check in and then stroll back for a leisurely breakfast and then back to the terminal for departure. What fools we are, LOL. First off it took much longer than we thought to condense everything down to two small bags, there was an issue with the bill, so our intention to get to check in 2 hours early was cut to 1 hour. Once we got there the check in at the airport was slow with only one check-in counter open for international flights but finally we were checked and the only thing left to do was to get some US Currency. Our destination is a lodge called Tongabezi near a town called Livingstone, close to Victoria Falls in Zambia. To enter Zambia you need a visa that costs US$50, now I'm sure Kelly told me this but when you get to my age the memory starts to go, also if you plan to view the falls from Zimbabwe you also need US dollars as that is the monetary currency they now use. We had about US$35 on us so we had to get some more, unfortunately our experiences with the banks in the airport were less than fruitful and with negotiations at the counter becoming prolonged I noticed that it was 10am and our boarding time was 9:55. To make matters worse we still had to do customs and get to the gate. Our only choice was to get the card back and head for customs, this would of course come back to cause me grief. Kelly got through before me and headed to the gate, while I waited my turn. Once past customs I headed for the gate, now if you have never been to Johannesburg International Airport, let me tell you its a hell of a big terminal. About halfway to the gate I saw the departure board and next to our flight was the word CLOSED! Oh oh, I started running, later Kelly told me she had the same reaction. By the time I'd got to the gate, Kelly had been pleading with the gate staff to let us on, they told her that they had already advised them to remove our bags but as luck would have it they were having trouble locating them. So by the time I got there, Kelly had convinced them to let us on and there was a shuttle bus with about 10 passengers still waiting to take us out to the plane. I don't know how many flights they have to Vic Falls but I know they sell out almost every flight so we were very lucky to make it. Once in the plane we sat for about 15 minutes until we taxied out and took off for Zambia. After about and hour and a half we flew over Victoria Falls and made our descent and landing into Livingstone International Airport and headed for the customs hall. I was first through and was directed toward a table with custom forms for us to fill out, as we only had one pen between us I filled mine out first and said to Kelly I'd go through and get the bags. I fronted up to the customs officer and presented him my passport. He noted that I didn't have a visa and told me it would cost US $50!!!! Oh oh, we only had about $35 between us so I asked him if he took credit cards and of course they don't. He told me there was a bank just outside customs and I could get some US Dollars there. I headed out of customs, found the bank and fortunately they had US $150 they could exchange for 1,200 Rand which I just happen to have. I got the dollars and headed back into the customs area to see Kelly, looking a bit distraught, about to front up to the customs guy. For some reason she thought we had enough money for the visas and that I had just left her penniless and had headed out of the terminal. I explained to her that we didn't have enough and that I was lucky to have scored enough to get us in. So finally we are through, we find our designated driver and head out, hopefully to our lodge, Tongabezi about 27 kilometres down the river from the falls. We have to make a quick stop in Livingstone first to pick up a couple more passenger. We pull up at the Kobil station, hmmm what does that remind me of? ... Tonagabezi is a green paradise. We were greeted with a big smile and warm refresher towels by Gloria who took us down a flight of stone steps to the reception room. We signed in and noticed in the quest book that there were a family who had signed in the day before who lived in Balmain not more than five minutes walk from our place. Unfortunately we never caught up with them as they were staying at on an island run by Tongabezi. Once we had signed in we met Given. Given would be looking after us for the duration of our stay at Tongabezi and without further ado he grabbed our bags and lead us off down into the garden and through to our room, appropriately called the “Dog House”. The room is the furthest away in the lodge, down a stone path and then down a winding raised tile path. It’s a long walk but worth it. 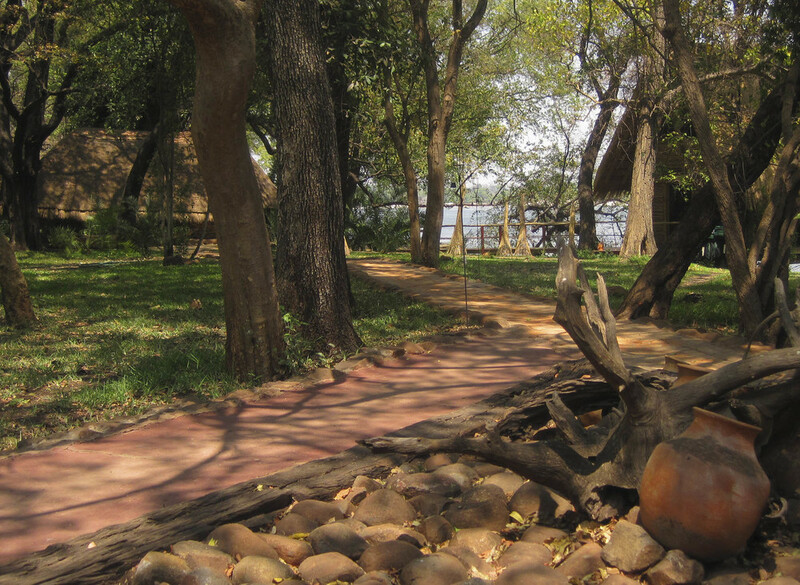 You enter through a wooden door in a small wall and the room is completely open on one side to the Zambezi river. There is a huge king bed on a raised dais that has a direct view of the river, on one side is a deep bath where you can soak and watch the sun go down. In front of the room, between it and the river is a grass verge, when we walked in it was full of monkeys, running up and jumping from tree to tree, sitting resting, scratching you name it. In the distance you could hear the hippos in the Zambezi snorting and grunting. Heaven. We settled in and headed down to the bar area for a bite of lunch and to meet our event co-ordinator. Victoria Falls is a bit like Queenstown, New Zealand lots of activities like Bunji jumping, White Water Rafting, Ultra light flights, Helicopter flights etc. As far as Kelly and I were concerned the only thing that we had on the agenda was a dip in the Devils Pool. We set up a time for the next morning and also booked a sunset river cruise, from the lodge, for this evening. Those of us going on the sunset tour gathered at about 5pm at the bar and were met by Aston, our guide for the tour. There were six of us in total and he led us down to a small motorboat moored at the dock. We climbed aboard and Aston headed up river, on our right was Zambia and on our left was Zimbabwe. The Zimbabwe side was a sandy bank and it was all part of the Zimbabwe National Game Reserve. Not realising that in Africa everywhere you go are animals I hadn’t brought my long lens so I couldn’t really get any good shots but we saw Fresh water crocodile, a Waterbuck and lots of monkeys. As the sun started to set Aston turned downstream and headed toward an island, apparently called no mans island, in the middle of the river. The sun was setting the wind had dropped and the river was like glass when Aston grounded the boat on the island. No mans island was actually inhabited by one of the lodges staff who’d predicated our landing and had set up a table with drinks just in time for the final sunset. Sundowners being served on "No Man's Island"
So as the sunset behind the trees of the reserve, we sipped our Gin and Tonics and squished our toes into the squeaky white sand of the island. Once the drinks were done we headed back to Tongabezi to have break and get ready for dinner. Returning to the room we were amazed to see all of the lanterns had candles burning in them, the bed was turned down and there was a full bath, with bath salts, ready for our return. Needless to say we wasted no time in hopping in for a soak. Getting to dinner is the same at Tongabezi as it was at Ulusaba. You ring for a quide to come get you, at Ulusaba you pick up the phone and dial 212 in Tongabezi you pick up the phone, crank a little handle to get attention and then hold down a button on the phone to talk. In a couple of minutes we were on our way flashlights in hand, on either side of the bed they have flashlights for each guest, following Given down what we called “the Yellow Brick Road”, As we reached the end of the road Given said I think there is a Hippo ahead, and not a minute later our torches picked out a huge Hippo standing between the path and one of the cottages. Gavin suggested we take a bit of a detour as a charging Hippo is not something you want to see, especially if its charging at you. Dinner on the deck overlooking the river was wonderful but after another hectic day we were so ready for bed and once done Gavin took us back home, avoiding the Hippo, and about 5 minutes later we were fast asleep.